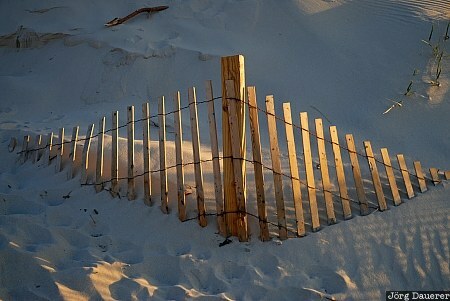 A fence submerged by sand at the beach in North Dennis at Cape Cod Bay illuminated by warm evening light. North Dennis is on Cape Cod at the Atlantic coast of Massachusetts, United States. This photo was taken in the evening of a sunny day in May of 2010. This photo was taken with a digital camera.